Easy cornersA Wari corner, or easy corner, allows for two door-mounted baskets and two slide-mounted baskets within the cabinet that separate for ease of access as you open the door. 3. 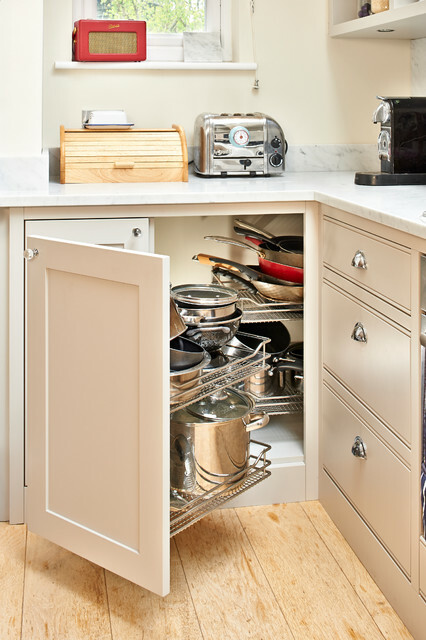 Access your corner cupboardIn theory, a corner cupboard has plenty of space for storing bulky skillets and saucepans. In practice, though, it can be impossible to reach everything. Here’s the solution: a nifty pull-out mechanism that provides easy-to-access shelves for your cookware. The system works on runners and is attached to the door, so each time you open the cupboard, the shelves slide out with it.